Creative Gift Ideas. Unique Personalized Gifts. Engraved Gifts. Creative Gift Ideas has everything you want in Personalized and Engraved gifts for Every Celebration. Lots of celebrations to look forward to. Many of you will be attending bridal showers and then the wedding, anniversaries, graduations, baptisms/christenings, first communion and confirmations. Let us help you with your gift-giving ideas. Personalize it and make it extra-special and charming. We welcome you to our shop and thanks for your supporting our small biz! Shop easy. You'll save time because the exact same beautiful personalized gifts from the top online shops are all here in one place. We advertise for them at no extra cost to you. We welcome you and value your trust. Each and every merchant in our group is carefully screened and monitored for safety and we want you to know right up front that this is a secure site. No worries there. We also carry other gift ideas you may like for your family and friends like official sports team gifts, photo calendars, inexpensive gifts (under $20), teacher gift ideas and tons more gift ideas for everyone in the family. It's not called a national pastime for nothing. We love our sports teams. You can find their favorite team and surprise them with a gift that shows their team spirit and pride with a hat, t-shirt, clock, throws, pillow pets, purses, and so many more. This is a very creative gift idea. College teams too. Speaking of gifts, we have hand-picked gifts you will be proud to give; nice, classy gifts to make them feel special and their celebration complete. Our gifts are from well-known merchants; stores you already know and trust. A Gift Personalized, 1800 Flowers, Gifts for You Now, Bass Pro Shops, Barnes and Noble, Miles Kimball, FTD florist, Personalization Mall, The Bradford Exchange, Things Remembered, Beau Coup Favors, Fanatics, Fans Edge, Miles Kimball, Waterford, Life is Good, NFL Shop, Gift Baskets.com, Gourmet Gift Baskets, Timeless Message (message in a bottle) and that's just to name a few. We have "hard to buy for" gifts. Looking for creative money gifts ideas? Would you like to know how to give cash or check gift and ways to disguise money? Here's some ideas. Buy an inexpensive set of glasses, decorative or keepsake box, money clip and hide the cash or card in them and wrap as usual. Done! Get a bag at the dollar store and you are totally done. One time, I hid cash inside a cereal box and fooled my kids! A small pizza box gives a great laugh! Recycle an old box. Creative gift ideas. Just use your imagination. An inexpensive personalized wallet creates a two-gifts-in-one and makes a fun place to stash cash or card gift. Professional lessons in the privacy of their own home. Think of the possibilities they could do with a gift like this. These are life-changing gifts. 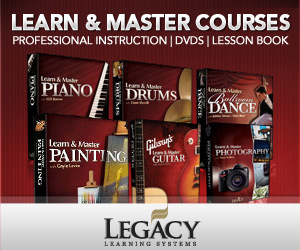 Learn guitar, ballroom dancing, photography, painting and more. Thank you for visiting Creative Gift Ideas, we really appreciate your visit - Click here if you want to know how to build a website. It's fun and exciting! Please know that it brings us pleasure to help you choose a gift. We value your trust and appreciate your visit to Creative Gift Ideas online gift shop. Please let us know how we can serve you best! Looking for a specific item or gift? We can find it because we have access to every stores products. Let us help. We offer a free service to help you find the gift you are looking for. Maybe you heard about it or have something in mind. In most cases, we can supply a picture, description and price of the item and send you to the page on this site to purchase the item. Fill out short form, only takes a minute. We'll e-mail you to view this gift as quickly as possible. Just go HERE. Thanks!